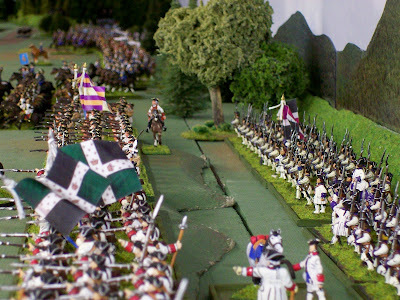 The battle of Minden occurred 1 August 1759. 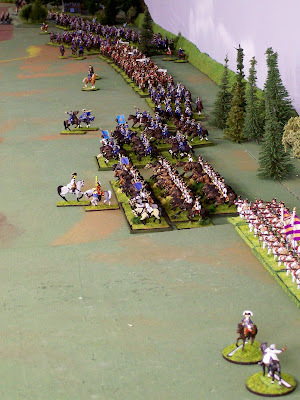 On 1 August 2009 our group will commemorate the 250th anniversary with a partial-simulation of the great cavalry battle. Click on photographs to enlarge them. 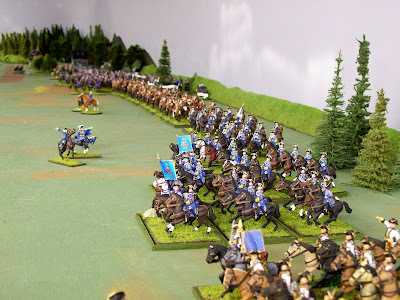 General Beaupreau's infantry guards the left flank of the first line of cavalry. The French are in a column of squadrons as leading regiments wheel into line. That's Commissaire Général in the center in near-white coats. 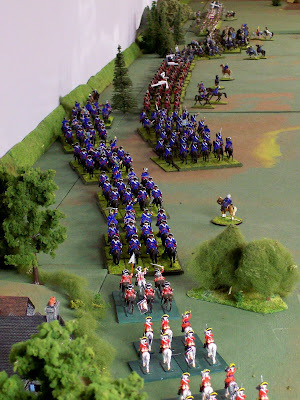 The second regiment is beginning to wheel right into line. Looking the other way. We don't have enough French. This is the Saxon Dragoon Regiment von Brühl. It was not classified as chevauleger. See 25 May 2009 entry here. 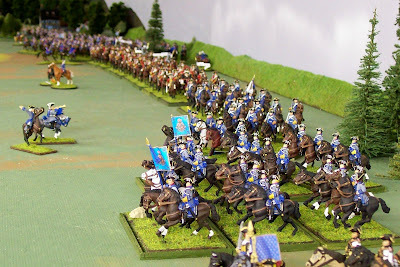 The von Brühl Dragoons in four squadrons. 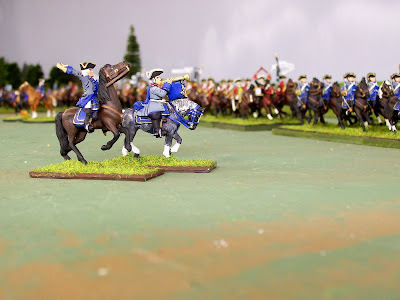 The Horse Grenadier Troop is scheduled to be painted before September. Only dragoons had horse grenadiers. Commanding officer halts the first squadron. 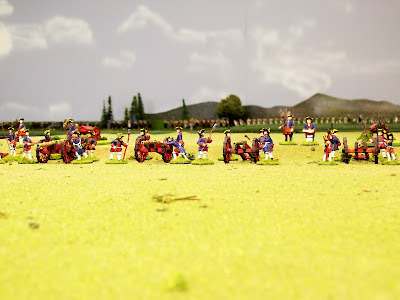 More Saxons: Rutowski Chevauleger Regiment. On Saturday they will stand in for the French Gendarmes given the red coats. Régiment Royal officers confer. 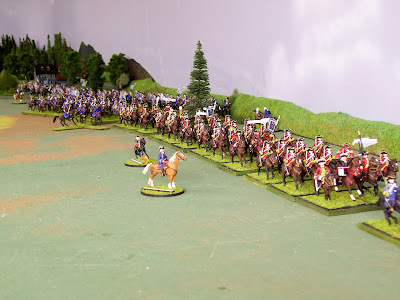 To the left of the regiment you see the French Royal des Carabiniers leading the second line onto Minden Heath. 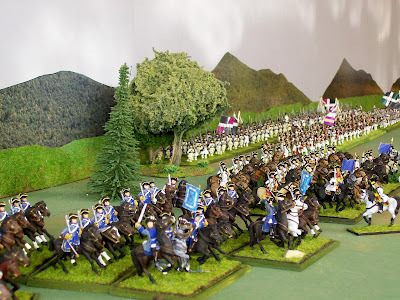 Our contemporary Der Alte Fritz gave them the nom de guerre, "The Thundering Herd" because they number sixty miniatures. Looking back the other way again. The unit in the near foreground is Colonel Général. The French artillery line protecting the deployment you just observed behind them. Your thoughts/sentiments are welcome. Click on comments below. You may need to identify yourself as anonymous. 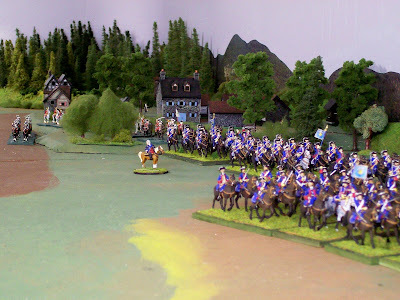 Der Alte is bringing 120 more French horse. Randy, Brent and Andy will add more. Next week Der Alte or I will advise how many. "Forced perspective" was used for photos around Minden. The buildings are 15mm from Miniature Building Authority. 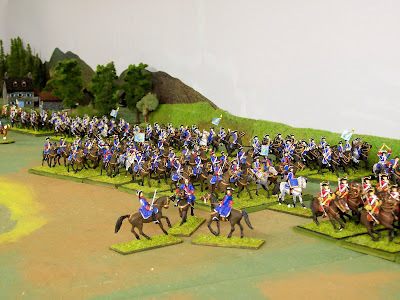 Plus, the cavalry thereabouts are successively smaller, the last being Jack Scruby 25mms. This kind of dynamic causes the eye and mind to think distance is greater than it actually is. The rest of the Army is 28-30mm. I sense both commanders are nervous about this game. 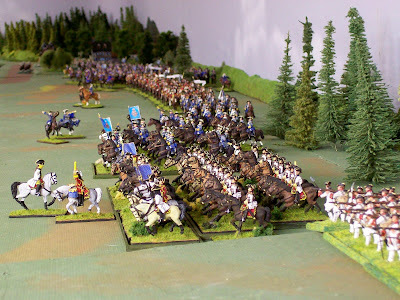 As the French CinC, I think my horsemen are going to get almost totally ruined. Jim, on the other hand is worried about his infantry doing enough damage to stop French charges. It is my intention to kind of interview participants about their own thinking, tensions and feelings before, during and after the game. We might get some quotes for you. See 13 March 2009 story here. Come back here next week and no doubt check in with the blog of Der Alte Fritz to see more photos and commentary. A splendid sight. Personally, I predict a French victory provided enough of the cavalry count as armored. Thanks for the posting, Bill. Quite a site, and I'm sure the game will be better still. The tension mounts . . . . I predict a very bloody battle, for both sides. 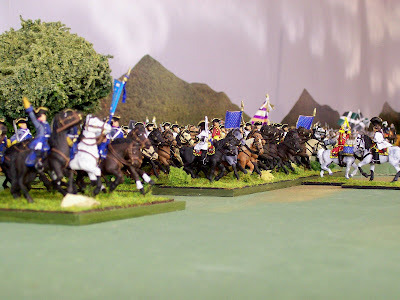 All of that French cavalry roaming around at will with virtually no Allied cavalry to contest them, does indeed make the redcoats a bit nervous. Beautiful pics and very cleverly done too! Ah - those lines of infantry in the background... c'est magnifique...! As usual, lots of eye candy for us poor isolated folks! Wish I could be there to push some lead with you all! for your keen interest and kind sentiments. We appreciate you and these very much. Looks like a wonderful set-up for the planned game. I'm eager to read/see more as it becomes available. All that I can say would merely echo the previous comments. Splendid troops and inspiring photos indeed. Great preview, looking forward for the battle report. Where do I send the roses.